I was very intrigued by OfficeSupplyGeek's post on creating your own highlighter, especially the part about filling the barrel with ink. I wasn't too sure I wanted to mess with silicon grease, but I really wanted to try this. Then I read Future; Nostalgic's method using PTFE tape instead of silicon grease, and knew I had to give this a go. Several hardware stores weren't sure what I was talking about when I asked for PTFE tape for pipe joints, but I finally found one that had it and only charged $1 for the roll. I decided to try it first with one of my trusty Rotring Surf medium nib fountain pens. I emptied and washed the pen and let it dry, then followed the instructions quite easily. I wound the tape counterclockwise, trying not to be too loose or too tight. Filled the barrel with water and passed that test. Finally, I filled the barrel with Noodler's Legal Blue, and everything worked perfectly. No leakage at all, and I don't have to worry about refilling a converter. I did leave a piece of tape on the side, it was pushed up during the tightening process and looks like a tag of some kind. I kind of like the way it looks, but I'm also leaving it so I'll remember what this is and not try to take apart the barrel by mistake. So of course I wanted to try again, this time using my much loved Faber Castell Ambition black resin medium nib fountain pen. This pen has given me some problems, because I've had a hard time finding a converter that will fit it or stay put. I love the pen but hadn't used it as much as I wanted to because of the leaky converter. I could have just gone back to ink cartridges, but by that time I had expanded my collection and kind of forgot about it. Once again, I wound the tape and fitted the barrel to the nib. But there was too much tape and the barrel got stuck. Oh well, try again. Hmmm, I didn't know the nib came out of the metal attachment, but it's got a threaded area that may leak. Let's tape that and put it back together so there won't be any problems down the line. And let's try again with the barrel. And again. Finally, on the fifth try I was able to get the two pieces together. I have to admit that by that time I was really tired of this whole project and just wanted to try out my pen. So I skipped the water test (risky!) and went straight to filling the barrel with J. Herbin Poussiere de Lune ink, moon dust purple and the first bottled ink I'd ever purchased. Filled the barrel, tightened everything, and it worked. No leaks, and some fine writing. Back in February 2009 I was taking the M14 bus across town, heading east on 14th Street to get home. At 6th Avenue we stop to let people on and off, and I look to my left and see a man walking across the avenue with a black and white cat on top of his head. I grabbed my camera and, somehow, just as the guy came into line with me and a second before we took off, I snapped the picture and caught the scene. It was amazing. If I tried that with my boy, Bast's Gift, he'd rip my scalp off. So when I get home I immediately email the pic to everyone with one of those "LOOKATTHISGUY!!! HE'S-GOT-A-CAT-ON-THE-HEAD!!!" subject lines more in keeping with enlargement pills and other spam. But this was truly unusual, even for Manhattan and us jaded NYC-ites. And the next day this came back to me from my friend Joe, a psychedelic version he created for me of the Cat On The Head. Muji is one of those elegant Asian stores you find in coast cities with neighborhoods like Chinatown, Little Seoul, and Tokyo-Lite. There are three Muji stores in Manhattan, and one at JFK airport for people on the go. Well-cut clothes, nylon bags, nice spare furniture, and all those really interesting things you never knew you needed--small silver polishing cloths, polyvinyl pill and earring boxes, individually wrapped Q-tips. Japanese ingenuity at its best, and all reasonably priced. If you happen to be on West 19th Street off 5th Avenue, there are two places to visit: Uncle Moe's Tacos (for the steak burrito) and Muji Chelsea at 16 W. 19th Street. Through September 13, 2009, all pens and other writing accessories ate 10% off. And if you prefer to build your own pen from scratch, you can purchase a polycarbonate shell and your choice of gel ink or oil-based ballpoint ink cartridges for a total of $1.60 or less. The gel pen I'm using to write this is a 0.38mm in dark green, on Staples bagasse paper. The pen is a bit scratchy on this pad, and there is a definite shadow on the other side but no bleed through. I first read about these pens in a New York Times column a few weeks back, and went to Muji Chelsea to give it a try. I really liked the look and feel of the pen and bought quite a few. The pen comes in 0.38mm and 0.5mm; if you decide to build your own, you can also get a refill in 1.0mm. But be careful--the ink refills are in Japanese with no English translation, and the oil-based ballpoints and gel inks look exactly the same and have been mixed in with each other. Check at the register to make sure you're getting the one you want; I have 4 ballpoint refills sitting in my pen drawer, hoping I'll give up gel ink soon and come back to them. I really prefer the 0.38mm, it has a smoother feel to it. But YMMV. And you have lots of colors to choose from: black, dark blue, light blue, red, yellow, orange, pink, dark green, and light green. I managed to get a few pics of the pen area, an amazing display of color and plastic. Gel pens, oil based ballpoints, mechanical pencils, multi-ballpoints, fountain pens, pen cases, scissors, erasers, and colored drawing pencils. And underneath are the papers, notepads, journals and scratchpads. Lots and lots of paper. A 5-pack of B5 30 line notebooks similar to Moleskine is $3.95 plus tax (you can see them in the pic of my Muji stash, mid-to-upper left with the dark gray border). 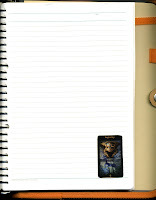 Notepads in the A4 range (8.5 x 11) are a cream color with a vinyl protector and run abut $1.75 plus tax. There are binders and loose leaf, journals, newsprint, scratch pads, and more for very, very little money. These are most of my Muji purchases, including the set of colored pens for $7.50 plus tax and the vinyl carryalls I use for pens, pads, change and whatever else I don't want to lose in my handbag. The paper varies, from smooth Rhodia 80gm style notebooks to newsprint scratchpads and drawing journals. And if you're not interested in pens or paper, check out the housewares, bedding and linens, shoes and clothing. Canvas sneakers are on sale for 30% off ($20 down to $14). The size is interesting. My foot grew into a 7, went down to a 6.5 in most shoes, but in this particular sneaker I wear a 6. I recently bought a 10-pack of Hero 266 fountain pens on eBay, where you can find them for less than $15 with free shipping. Made in Shanghai, Hero has been around since 1931 and according to the PR is the most popular brand in China. I was keen to try these out for several reasons: they are a slim pen with a fine nib, which is my favorite; they are aerometric, loading ink using a pump to fill an unremovable resevoir, something I've never tried; and they are so inexpensive (though not cheap looking) that they seem like throwaways yet I want to keep using them--so how long will they last? So how does it write? Quite nicely. I like the fine line of the nib, which doesn't drag too much across the Doane Paper. The ink line seems like it's between a fine and a medium width, something I've wanted given how fragile some of my inks look in fine point and how sloppy they look in medium. This is right in between, and it handles the Iroshizuku ink in Syo-ro beautifully (below picture). The pine green color comes through but doesn't overwhelm. These are great pens, but I have no idea how long they will last. Nor can I change inks by simply emptying the converter and running warm water through to clean everything. Given the price I'm sure I'll be buying more quite soon, so I'll always have some empty ones around in case I can't figure out which ink to use for a refill. This Itoya rollerball came my way about 9 years ago, when a friend bought one at Kate's Paperie. I loved the copper color and slim line to it, and immediately bought one. Had I known Itoya would discontinue them I would have bought several more in different colors. The refill is a Pelikan rollerball with a medium point. The kind salesman at Art Brown went through a few of them to try and find one that would fit. Finally he did, tho' he had to widen the front a tad to get the refill to work. This has a lovely, soft feel to it, as if the tip of the pen truly is gliding over the Rhodia notepad. No bleed through of the ink, so overall a great writing experience. This pen is a Rotring 900, a ballpoint that's been fitted with a Visconti gel ink cartridge in turquoise, courtesy of one of the Art Brown salesclerks. Great bunch of guys, and the one who waited on me (Scot's accent) was using a ballpoint with this ink cartridge. As he was fixing this pen for me, I asked for a refill for this in the same turquoise, and love it! This pen belonged to a friend who died in February 1996. She got it as a Christmas gift in 1995, and we all loved it! I was the lucky one who inherited her cherished pen. Given all the journals and notebooks I own, I've wanted to make my own Tarot Journal for some time from my collection. So I finally got around to it this past week with the help of a friend, whose photoshop skills and general advice were needed and especially appreciated. The tarot cards are a new deck I'd been waiting on and finally bought from Amazon.com, made by Ciro Marchetti--The Legacy of the Divine Tarot. 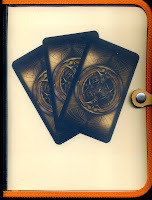 I definitely wanted to use these for my Tarot Journal as they are very beautiful but also very different from many other decks I've used in the past. First step was to scan the cards into my computer. Then a friend re-sized them to 50% of the original, and we printed them on a Xerox Phaser color laser printer using ivory card stock. Bright white card stock might have been a better choice, but as we didn't have any on hand and I didn't want to wait, we went with the ivory. The detail of the cards even when shrunk is amazing, and the ivory color doesn't distract. The journal I'm using is one I picked up at Kinokuniya in NYC across the avenue from Bryant Park, a Maruman 26-ring clear vinyl binder with a leather snap closure measuring 8.5 x 11. I love the orange cloth outline, and the size is really convenient--it seems to just fit into my hand. I also really love the leather and brass closure snap, a classy way to keep the journal closed in a very stylish manner. Another great feature that really attracted me is the binder's clear vinyl body and the front and back pockets. The pockets already contained thick white paper with some advertising on them (a picture of a fork swirling pasta, with Japanese pictographs underneath it) that acted as covers so you couldn't see what was written inside. So I was able to use that paper as a cutting pattern to make front and back covers that had my own design on them. And better still, I can change the images at any time should I want to look at different cards. 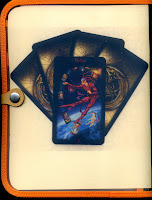 The front cover shows the Marchetti deck's card design, and the back cover shows The Fool surrounded by the card design. The cards were printed, cut and pasted to a sheet of 26-hole paper. 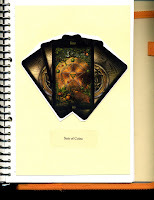 The I took some images from the cards, enlarged them a bit, and created a front and back cover and title pages for each of the four suits (rods, cups, swords, coins) and the Major Arcana. For each suit I used an image of that suit's Ace which was printed on white paper and then cut and pasted to the ivory card stock. That in turn is cut and pasted to the 26-hole paper. These will serve as chapter pages at the beginning of each suit, and with the heavier weight they will make the suits easier to turn to when I'm looking for a specific card. For the Major Arcana, I printed out The Fool card, also printed on white paper and matted to the ivory card stock. I also have sections for notes on various subjects as well, and may make some additional chapters grouping the numbers and court cards together. The final step was to print up a title label for each card and section, and then paste those onto the pages. And voila! I've now used one of my favorite journals, taking advantage of its idiosyncracies such as the clear vinyl and snap closure, to finally complete a wonderful project that I've wanted to create for some time. This will be a great re-addition to my journal collection. Now to choose among all my pens and get to work transferring notes and observations made through the years to my "new" Tarot Journal. This has become a favorite recipe. Serve over romaine lettuce and you've got a great lunch. Mix all ingredients in a large bowl, chill. Makes 8 to 10 servings, 23 calories per ounce. I plan on trying a variation of this with tuna. For some time now I have wanted to buy one of the Costco 4 pound cans of tuna, but what would I do with it? Curried tuna comes to mind--can't wait! When writing with a fine point fountain pen, I definitely feel a strong color is necessary because of the thin line of the nib. And what could be stronger--more final, if you will--than black. Black-black, glossy black, matte black. Black with blue, black with green, black with any color scheme! I love an ink that announces its presence by being silent. Blue whispers. Red step-dances. Black is silent, letting you be the first to talk. 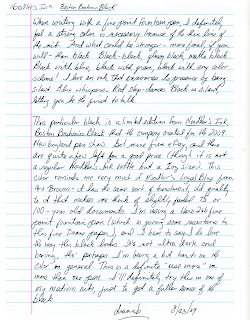 This particular black is a limited edition from Noodler's Ink, Boston Brahmin Black, which the company created for the 2009 New England Pen Show. Got mine from eBay, where there are quite a few left for a good price (though it is not a regular Noodler's ink bottle but a 1 oz. size). This color reminds me very much of Noodler's Legal Blue from Art Brown--it has the same sort of translucent, old quality to it that makes me think of slightly faded 75 or 100-year old documents. I'm using a Hero 266 fine nib fountain pen (which is giving some resistance to this fine Doane Paper), and I have to say I do love the way this black looks. It's not ultra dark and boring, tho' perhaps I'm being a bit harsh on the color in general. This is a definite "use more" in more than one pen. I'll definitely try this in one of my medium nibs, just to get a fuller sens of the black. This is the Iroshizuku ink by Pilot in Fuyu-syogun, available at JetPens. It is a steel-gray blue, definitely a strong color but not bold. It takes awhile to work on your sense of sight, and using it in a medium nib Rotring Surf on Doane Paper makes the color seem even stronger. I had first tried it in a fine nib pen, and didn't like it at all. On no, a dud -- and an expensive dud at that! But a few hours and several Cherry Zero Cokes later I got out a medium nib, filled it up, and...let it sit for a few weeks. And now I have to admit, I really like this color. Dark, brooding skies aren't my style, and I don't gravitate towards battleships. But I am becoming very fond of Fuyu-syogun, as the color seems to have a softer personality than I'd originally noticed. And I'm also becoming very fond of this Doane Paper. I am not a big fan of grid paper, but the grid+lines format is starting to work for me. 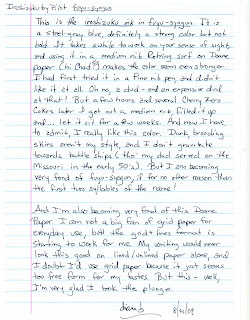 My writing would never look this good on lined/unlined paper alone, and I doubt I'd use grid paper because it just seems too free form for my tastes. But this paper is very different, I'm very glad I took the plunge (thanks to The Pen Addict). A picture of my notebooks, journals, and writing pads. In the back is my Kindle DX, with a Rotring Surf fountain pen and two journals to keep notes on several books I'm reading (a Rhodia and an Apica). So here are my Moleskines, Rhodias, Clairfontaines, a Whitelines, some Maruman colored small ring binders with notepaper from Kinokuniya, larger cardboard ring binders in black and tan from Muji USA, Doane Paper and Muji USA cream and brown blank pads, and many others. There are some at my office, but this is my main stash. Seeing, this, I can't understand why I can never find a sheet of paper to write on when I need one. Quite a few of these were acquired at my two favorite stores, Home Goods and Cheap Charlie's. The two Moleskine-type journals on the left with the turquoise elastic band are from Home Goods, as are two black Italian leather ones to the left of the Field Notes. Cheap Charlie's is an East Village institution. Charlie started off with a store on East 14th Street near Avenue B, and had been there 41 years selling books, paper plates, napkins, toys, journals, calendars, ceramics, glassware, and his specialty: 99 cent cards of all kinds. Around November 08 we found out the store was closing, the landlord wanted $5,000 a month rent and Charlie couldn't afford it. So we rushed in to buy out everything we could, and I got quite a few journals. There's a happy ending however. The store closed around February 09 on East 14th Street, and re-opened in March 09 on Avenue C between 10th and 11th. Charlie (who does exist) has a lot of different journals available between $1.99 and $3.99. In addtion, I've discovered the wonderful journals, notebooks and pads at Muji USA on East 19th Street (next to Uncle Moe's Tacos), and made my first visit to Paper Access on East 18th Street to check out the Rhodias and Whitelines goods. Very dangerous area for a journal junkie. without a picture of one of the kids. Seranne lying on my bed, taken in February 2009 when she was about 14 months old. Here's my review of J. Herbin's Bleu Nuit ink at The Pen Addict. I really appreciate Brad posting this, and the kind comments. I have to admit I was nervous someone was going to question my take on the color or something, shouldn't have worried as they are great people! Unposted has a great review of the Exacompta Exaboard, so you can imagine how excited I was when I found it at Paper Access (23 W. 18th Street in NYC) for $20.95 plus tax. 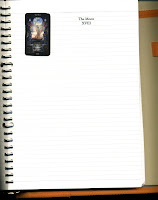 But that also included the lined A4 notepad, so I'd say I got a great deal. I'm still figuring out how this blogging stuff works. So I won't even try to post pictures right now, just go to Unposted and feast your eyes. But one thing that caught my attention was the inside shiny sheet with pics of the whole Exactive line. I'm really lemming* an Exacase and an Exafolio, and will start hunting for those. I could contact Karen Doherty at Exaclair to ask where these are stocked in NYC, but why apply logic to the situation? I'll just lose myself in the city, go wandering around to different stationers and office suppliers until I can find these. An Exa-McGuffin adventure! *lemming--a term coined at MakeUpAlley.com, a makeup swap board I used to hang out on. When someone raved about a product, like lemmings we thousands would go out and buy it. So shorthand for wanting something was to lemming, as in "I am lemming one of the iroshizuku inks I saw on JetPens.com."